Goalkeeper Seb Brown and forward Jack Midson are among eight players released by League Two side AFC Wimbledon. Defenders Will Antwi, Callum Kennedy and Rhys Weston, midfielder Peter Sweeney and strikers Luke Moore and Charlie Strutton are also departing. Brown and Moore helped the Dons win promotion to the Football League via the play-off final in 2011. Former Oxford man Midson scored 42 goals in 140 appearances during a three-year stay at Kingsmeadow. Charlie Sheringham and Jake Nicholson are set to have their futures decided in the next two weeks, while new deals have been offered to Jim Fenlon, Darren Jones, Sammy Moore and Aaron Morris. The remainder of the first-team squad are under contract for next season. 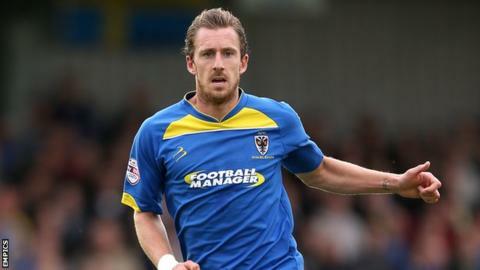 "Some of the players have played a massive part in the club's history and they will always be welcome back as heroes," AFC Wimbledon manager Neal Ardley told the club website. "All the players released have given everything for the club. "Decisions were made on each of the players based on certain factors. Some we could not afford to keep and others played in positions that we decided needed a shake-up."